The Maid Rite Sandwich Shop in Greenville must have some tasty sandwiches, leading their customers (drive-up and dine-in alike) to drool and loose their gum. How else can you explain the fact that customers routinely take chewed-up gum and stick it onto the outside of the building? 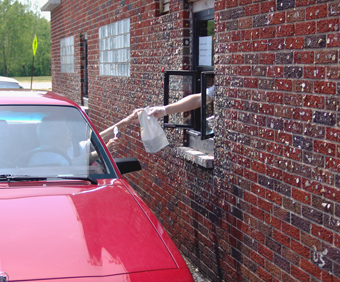 The entire exterior of the shop is covered with wads of gum, both on the drive-up side and the side facing the street. This less-than-appetizing display, however, doesn’t seem to keep sandwich-lovers away. When the Weird Ohio team visited the Wall of Gum we found it far stranger than we had anticipated. Fist of all, the place was HOPPING! But before we get into things, we should probably explain the lay of the land, so to speak. Picture yourself standing in the middle of the street looking at the building. Keeping that in mind: The front door in right in front of you. Along the right side of the building are two windows about 15 feet apart from each other. You order at the first and pick up at the second. When you've got your order, you drive straight into the parking lot (unlike other drive-thrus, you DON'T circle the building). The back of the building has a back door that locals use as their "take-out" door. The left side of the building is where the Gum Wall is. The ENTIRE length of the wall is literally covered in gum. In fact, there is so much gum there that there isn't much room left to stick newly chewed pieces. Because of that, people have started sticking gum near the back door, the front door, and even along the order/pickup windows. But while there is indeed gum near the order/pickup windows, that is NOT the Gum Wall. 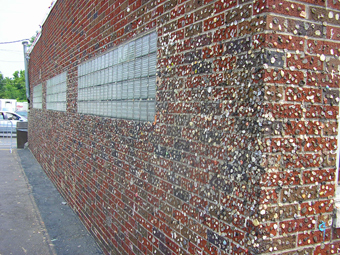 Like we said, the actual Gum Wall is on the left side of the building. All the other pieces were just stuck there when people started running out of room on the Gum Wall proper. As we said, this place is hopping, no matter when we visited. Cars line up at the drive-thru at least 5-6 cars deep, in some cases spilling out onto the street. It's nearly impossible to get a picture of the sign and gum wall together without cars being in the way. There are only 5 or so booths in the building, along with stools along a counter (just like a good ol' diner). You can actually order beer here, too (always a plus). As for the menu, there's only about 6 items listed, the big sellers being a Maid-Rite and a Maid-Rite with cheese. Basically, the Maid-Rite is browned beef on a hamburger bun with a couple of toppings (pickles, diced onions, etc.). Think White Castle, replace the patty with browned beef, and make it normal size and you've got a Maid-Rite sandwich. 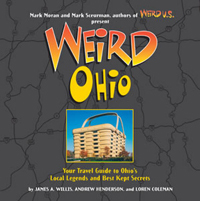 But for the true connoisseur of the weird the real culinary delicacy that draws patrons to Maid Rite is not to be found inside on the sandwich shop menu, but rather sticking to the outside walls in a gooey Technicolor display.